A solution of sodium hydroxide which is approximately 0.01M will be standardized with a solid acid, potassium hydrogen phthalate, to determine the exact Molarity of the base. 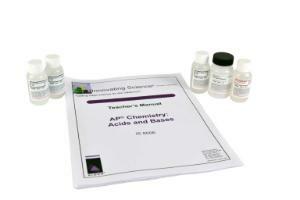 The standardized base will then be titrated against a monoprotic unknown acid to determine the molarity of the acid. A pH indicator and/or a pH meter will be used to determine the equivalence point. Ordering information: Includes Hydrochloric Acid, Sodium Hydroxide, Potassium Hydrogen Phthalate, and Phenolphthalein.